When the Ninja personal blender first hit the market, it almost seemed like a passing fad. 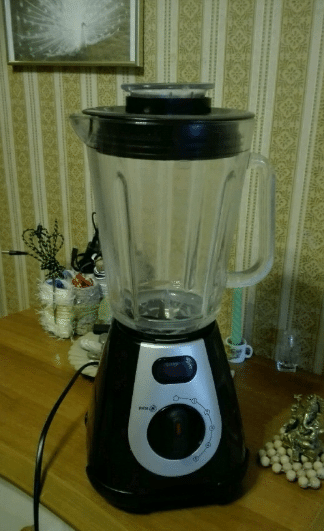 Infomercials and ads on the internet made these blenders seem like the next Shamwow. However, Ninja blenders have not only stood the test of time, but they have drastically improved upon their initial efforts. 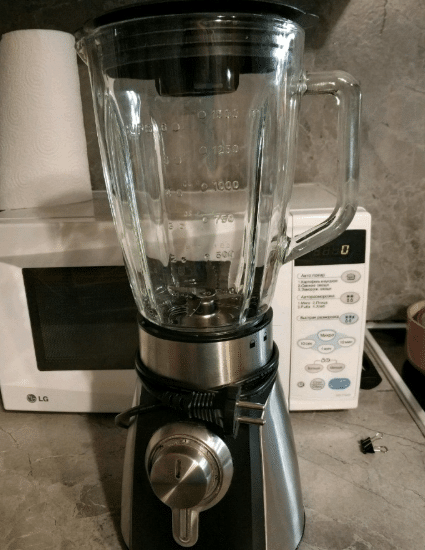 Now, years later, Ninja blenders are considered among the best blenders on the market in no small part to their Auto-IQ models. We have compiled a list of four blenders in our Ninja IQ blender review. As a young man, my relationship with blenders was limited, to say the least. When I got my first apartment, I bought the cheapest thing I could find at the local megastore. And for a couple of weeks, I tossed bananas, blueberries, yogurt, ice, and whatever else I had at hand in the pitcher and had a delicious, but chunky, smoothie. In fact, more times than not, I would find a quarter of a banana and a couple of berries at the bottom of my glass. But it wasn’t long before I got tired of cleaning the parts and cleaning off the counter after liquid escaped from the loose seal. After all, I was in college… Сleaning wasn’t really my thing. I abandoned my blender and sent it off to the confines of a random box of things I never used. It lived there for years with the other culinary rejects that I purchased with all good intentions. Cookie cutters, piping bags, knife sharpeners, and even a pasta roller kept it company as I hauled the box around from one apartment to the next. It wasn’t until my first daughter began eating real food that the blender came back into my life. As a chef, general lover of food, and husband to a fiercely Italian woman, I was excited to take my child on a culinary journey. We went to the market and grabbed fruits, vegetables, grains, and anything else that I thought I could puree. It was an exciting time, and yes I know that sounds ridiculous. But it was! My baby was eating mango, kiwi, passionfruit, and blueberries for breakfast. Preparing lunch and dinner looked more like the lab of a mad scientist than a kitchen! With pieces of kale and sweet potato ends scattered on the counter. But after a while, I realized that she needed texture, and that was something that my cheap, old blender couldn’t provide. Except, of course, in the form of that quarter banana at the bottom of her cup. So what I’m saying is that smoothies and baby food are great, but if that’s all your blender can do was it really worth buying? A blender, like any small appliance, should be versatile. It should be able to accomplish multiple tasks, introduce you to new cuisines, and inspire you to create your own concoctions. Okay, maybe that’s a bit much, but it should at least make a decent salsa, right? This is where the Ninja enters the conversation. They are so much more than that first blender you purchased (or found) in college. They can make pestos, salsas, fillings, bisques, sauces, doughs, and so much more. They are diverse enough to deserve some real estate on your kitchen counter, and your body (and schedule) will thank you for it in the long run. Today we have taken four of Ninja’s Auto-IQ blenders, and we will take an in-depth look at each one. As always, our intention is not to sell you anything, but to give you the information to choose the model that is best tailored to your needs. 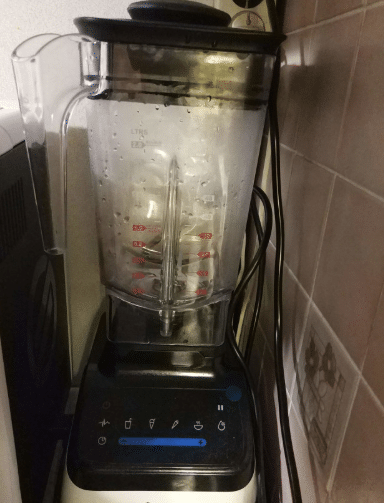 It goes without saying that Ninja makes a great product, but we will be looking at the cons as well as the pros in this Ninja Auto-IQ Blender Review. Before we get into the actual blenders, let’s take a second to understand exactly what Auto-Iq actually is. The easy answer is that its a preprogrammed system for your blender so you can hit a button and walk away. When you come back, Voila! You have a smoothie. But its really more involved and a whole lot cooler than that. The Auto-IQ system has set programs depending on the model. All settings operate under the same premise. You add the desired ingredients to the blender, touch the button, and walk away. So there is the Auto part. But the IQ part is what’s really special. Your Nutri Ninja blender begins a timer and starts to pulse the food. Next, it pauses to let the ingredients rest. 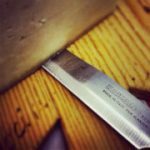 This allows the larger, thicker ingredients to settle back down into the blade’s grasp. Finally, it begins the blend cycle until the timer ends. Each model has its own unique Auto-IQ programs designed for a specific task. Now that we have the Auto-IQ tutorial out of the way, on to the reviews! With a smaller base and motor than the other models on the list, this blender is designed for personal use. Think of it as a Keurig for smoothies. While it may be small, it packs a punch with a Ninja Blender 1000 watt motor. 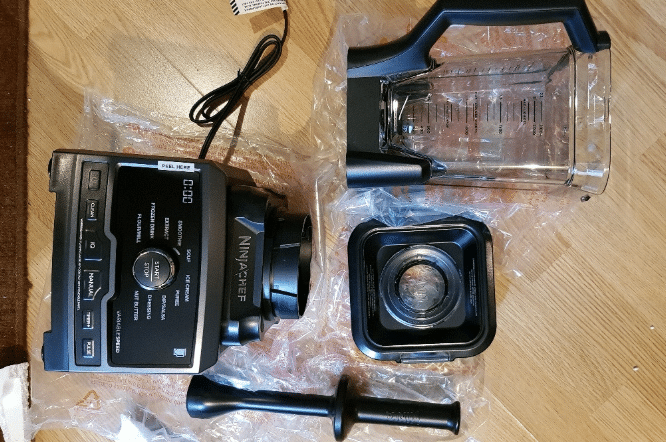 Construction – 1000 watt 120-volt motor, push control panel, Nutri Ninja Pro Extractor Blades, BPA free and dishwasher safe. Features – 2 program Auto-IQ (blend and ultra blend), 2 manual buttons (pulse and on/off), digital display timer that counts down on Auto-IQ settings and counts up to track time on manual settings. 18oz and 24oz Nutri Ninja Cups with Spout Lids with blades for blend and go smoothies. Starting guide with recipes included. 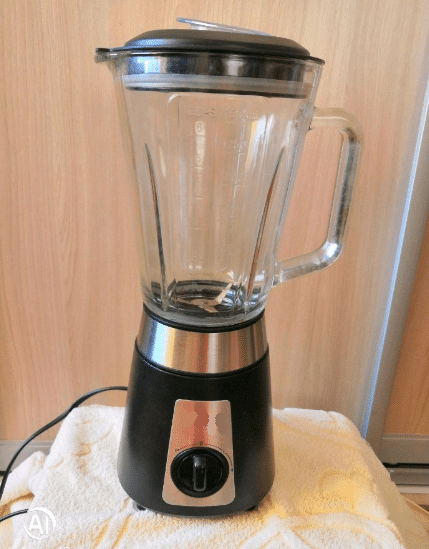 One user pulverizes seeds and grains in this blender! The Nutri Ninja Personal Blender quickly blends ingredients with a powerful motor. It is ideal for single servings and smoothies on the go. Most complaints about this model were that it is very loud when operating. A few complaints were made about the cups cracking easily, but the biggest complaint was that it is difficult to clean. Ultimately, this model is ideal for single serve smoothies. If you’re a parent or young professional on the go, this blender is what you’re looking for. There’s no need to make a big mess, minimal cleanup, and perfect portions for one or two people. This would also serve nicely for introducing foods to a baby as you don’t want to make too much food at once. The simple controls make for easy operation while the compact size keeps your counters free and clear. Just be diligent in cleaning your cups and blender after each use and you should never have a problem. Designed as a countertop blender system, this model is larger than most and can command quite the presence on your countertop. However, the Duo is more versatile than the Personal Blender model as it offers three sizes of cups and more Auto-Iq programs. 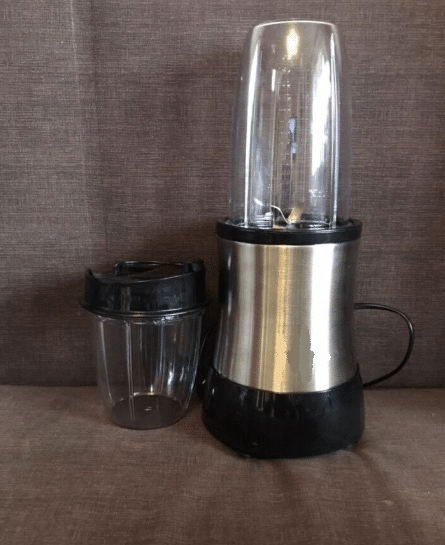 Construction – 1500 watt 120-volt motor, 72oz pitcher, Nutri Ninja Pro Extractor Blades, BPA free and dishwasher safe. Features – 5 Auto-IQ programs (blend, ultra blend, frozen drinks/smoothies, food puree, and pulse), 3 manual buttons (low/dough, med, high), digital timer display, 18oz, 24oz, and 32oz Nutri Ninja Cups with Sip and Seal Lids, starting guide with recipe book. Again many people were impressed with the power and speed of this blender. The extra Auto-IQ features allow for a broader range of ingredients (including ice) and the larger pitcher provides room for more involved recipes. There were a few reports of leaking and overall poor design especially pertaining to the blade’s construction and performance. However, most complaints were about it being bulky and heavy. This blender would serve nicely for a growing family, roommates, or even a college dorm. It has a variety of functions but doesn’t overcomplicate things with extra gadgets, etc. For a family with very young children, there is room to grow with your child or children. You can start off with purees for them as they are babies and keep using it as they graduate into smoothies and shakes. The range in size of the cups is also ideal for a family or house with roommates as you can portion your ingredients and tailor them to your ever-changing needs. While the massive 72oz pitcher could feed an army, the 32oz is great for just a few people. Of course, the 18oz and 24oz sizes are excellent choices for one person depending on how hungry/thirsty you may be. A bit different than the first two models on the list, this model doubles as a food processor. With Auto-IQ programs designed for both blending and processing, the Compact Blending System comes with a 40oz blend and prep bowl. Make beautiful salsas, guacamole, or even doughs and batters in this model. Construction – 1200 watt 120-volt motor, 72oz pitcher, Nutri Ninja Pro Extractor Blades, BPA free and dishwasher safe. Features – 3 Auto-IQ programs (extract, blend, chop), 3 manual buttons (pulse, low, on/off) and a Smooth Boost on/off button for extra smoothness, 40oz blend and prep bowl, (2) 24oz plastic cups with blades, (1) 24oz metal cup with blade, starting guide with recipes. This model is highly versatile with a plethora of container options. You can make shakes and smoothies in one container and then prep vegetables for a soup in another. Amazingly, many people reported wild success in making both pizza and cookie dough with the blend and prep bowl. While on user reported having water trapped in the handle after the first wash, most negative reviews focused on cracks in the containers and leaks. This leaves us to believe it may not be the best option for a heavy rotation in your kitchen arsenal. This blender is the most versatile model on the list, with the 40oz blend and prep bowl. While you can make purees for baby and smoothies for the grown-ups, it is also an excellent blender for the culinary adventurer. With an arsenal of recipe possibilities, this blender is ideal for the budding chef and the expert, alike. Making doughs is a huge plus when you consider the fact that you won’t have to pull out that heavy stand mixer every time you want to bake. Likewise, salsas and guacamoles will require so much less knife work and counter space saving you time and energy. The Smooth Boost option is also a big plus. While many blenders need two cycles to get the smoothness of a true puree, this option tells your blender to do the job in one push of a button. On the other hand, when you’re making recipes that require some texture, you simply turn off the Smooth Boost. Advertised as a countertop blender for not only smoothies but frozen drinks and shakes, too, this model has a large base with a large motor. This helps back up the claim that it can turn ice into snow. Designed to be the “family” blender, this Ninja Countertop Blender offers a few perks that the other models don’t like a frozen drink program and suction cup feet for stability. Construction – 1200 watt 120-volt motor, Nutri Ninja Pro Extractor Blades, BPA free and dishwasher safe. People were amazed by the power of this blender and its ability to crush ice as advertised. The suction cup feet provide peace of mind as they keep the large pitcher stable through heavy vibrations. There were two main complaints about this model. One was that it was very loud while in operation. The other was that it was too large. Many customers said there was not enough space between there countertops and cabinets for the blender to fit! This blender is a smoothie junkie’s dream come true! With a high powered engine and stable base, you could puree bricks! I wouldn’t recommend it though. Seriously, this blender has everything you need and can accommodate a large family or small party with ease. All of the options and IQ programs make it ideal for any recipe. Furthermore, the claim of turning ice into snow may be a little far-fetched, but according to reviews, it makes an excellent frozen drink. That is a rarity in the world of household blenders. Heck, even some commercial blenders can’t do that. While it may take up significant space on the counter, it can also handle a lot of your culinary needs, so, in the end, it comes down to how much you really think you’ll use it. The honest truth of the blender world is that some people just don’t need a blender. It’s sad but true. After all, there are plenty of prepackaged smoothies at the grocery store. The yogurt-based drinks, the plastic bottles that claim to have 30 different fruits and vegetables, and don’t forget the energy-protein shakes. But if you’re reading this article, chances are you like to cook, and you like to know what you’re putting in your body. That’s what makes the Nutri Ninja blenders so appealing to me. You may not be using heat, but you are definitely cooking! And you’re rewarding your body with fresh produce and grains. When you cook a nice dinner for yourself, you get that same feeling except you have a load of dishes to deal with after your meal. A blender is all in one. Rinse it out well, maybe give it a good scrubbing every other turn, and stick it in the dishwasher. That’s exactly what these blenders are offering you. So if you need an easy way to feed the family in the morning, or your looking to start (or continue) a healthy lifestyle, these Ninja blenders are a great way to make it happen. We hope our Ninja IQ blender review helps you find the perfect blender for your needs. 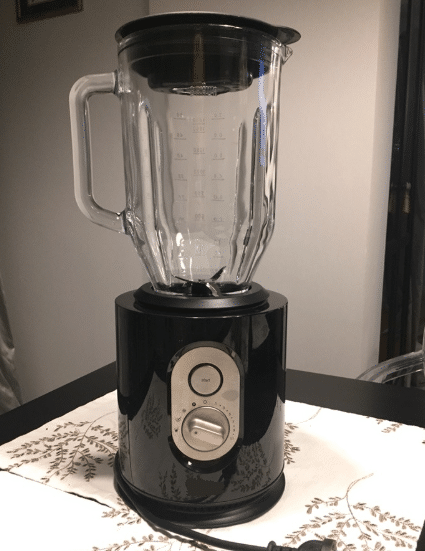 Best Ninja Blender Review – Your Smoothie Sensei! Best Blender for Acai Bowl – A Serving of Health!